Designed by H. S. Melville and printed by George Baxter using his patented Baxter Process in 1853. 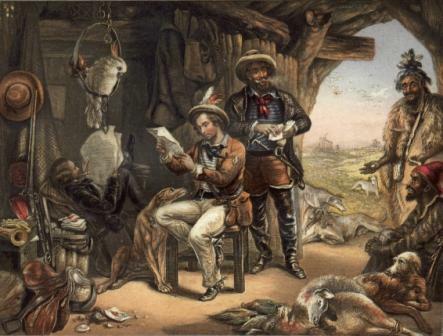 The print shows diggers at the gold-field surrounded by the accessories of a settler’s life. One of them is reading an account of the Great Exhibition. Another has a letter from home delivered by a native postman. The Print was published on a stamped mount and was also used to illustrate music, the ‘News from Home Quadrille’ published by Jullien & Co., 1853. Produced from a steel plate and twelve colour blocks. Originally sold at 1s. 6d. Le Blond and Vincent Brooks also published this print, produced from George Baxter's original plate.